Getting outside and exploring a place by bike, boat or foot has the effect of engaging a person more fully in their surroundings and heightening both the appreciation and the enjoyment of the experience. 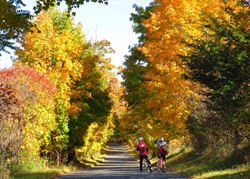 Great Freedom Adventures, an expert provider of active vacations, announces an exciting line up of 2016 bike tours and multi-sport vacations for all abilities. The inspired itineraries, led by knowledgeable local guides, immerse guests in the rich culture and natural beauty of each region. A sampling of destinations includes Vermont’s Green Mountains, Massachusetts’s gems such as Cape Cod, Nantucket, Martha’s Vineyard, Cape Ann, Boston and the North Shore, Rhode Island’s Newport and islands, and the Hudson River Valley of New York. Tours range in duration from three to six days and may include biking, hiking, kayaking, sailing and more. Guests gain an insider’s perspective and a unique appreciation of each region through the included history tours, demonstrations, wine and beer tastings, nature walks, museum visits and more. For the schedule of 2016 tours, go to: Cycling Tour and Active Vacation Calendar. Tours focus on the cuisine of each region and feature restaurants staffed by the region’s best chefs. These restaurants include some in unique locations such as a remote VT hilltop farm with a rustic post-and-beam restaurant graced with candlelight, white linen, sparkling crystal and a roaring fire – and truly superb farm-to-table fare. Each tour includes fine lodging that is carefully selected to provide upscale amenities while retaining the flavor and authenticity of each location. Expert Tour Leaders guide guests along each day’s route and provide area information as well as delicious snacks that incorporate fresh, local foods. Great Freedom Adventures is known for delivering upscale tours with exceptional service provided by these Tour Leaders. Great Freedom Adventures offers tours that are designed to allow each guest to actively discover a region, thus providing a completely different perspective. “Getting outside and exploring a place by bike, boat or foot has the effect of engaging a person more fully in their surroundings and heightening both the appreciation and the enjoyment of the experience,” says Jeanne Rummel, founder of Great Freedom Adventures. It would seem that past guests would agree as the company has a high percentage of repeat guests. For more information about the full line up of Great Freedom Adventures, go to: USA Bike Trips and Adventure Vacations.